More individual Californians purchased a Honda Civic than any other vehicle in 2013, according to new-vehicle registration data now available from Polk, which was recently acquired by IHS. Individual California car buyers purchased 65,910 Civics in 2013, more than any other vehicle in the state when subtracting sales to government and corporate fleet buyers. California is the largest vehicle market in the United States. "Retail sales leadership is the ultimate seal of approval, and Californians have made Civic the clear winner," said John Mendel, executive vice president of automobile sales for American Honda Motor Co., Inc. "Our focus on individual buyers is unmatched in the industry, and reflects our commitment to Honda customers and the investment they make in our products." Nationally, the Honda Civic ranked as the top-selling compact car in America with total sales of 336,180 units – and was one of three Honda models in the U.S. with sales of more than 300,000 units in 2013, with the Accord, Civic and CR-V combining to sell more than one million units. 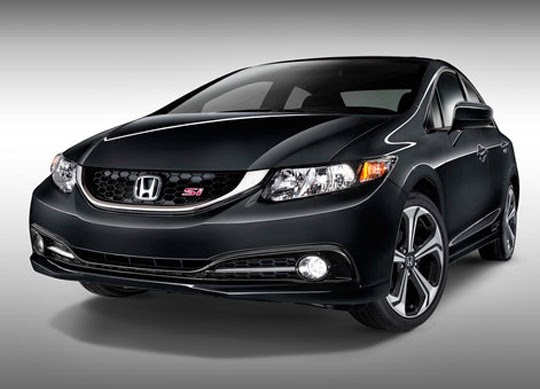 Honda has further improved the Civic for the 2014 model year with more performance, increased fuel economy, and additional new features including LaneWatch™ blind spot monitor, Smart Entry with Push Button Start, and Display Audio with 7-inch capacitive touchscreen. The 2014 Civic also marks the introduction of the HondaLink™ Next Generation connected-car technology. "The value proposition of Civic just keeps getting better," added Mendel. Based on IHS Automotive, Polk U.S. new retail vehicle registration data for 2013 in the Honda small car segment. The 2014 Civic is available as a 4-door sedan and 2-door coupe, and with gasoline, gas-electric hybrid and compressed natural gas powertrains. 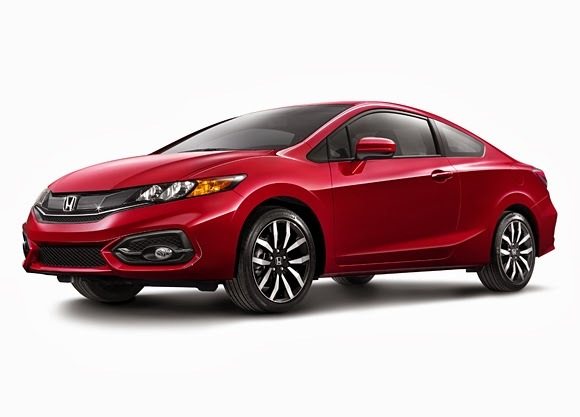 For customers interested in the ultimate performance Civic, there is the Civic Si Sedan and Si Coupe, both offering added performance, features and refinement for 2014. Honda offers a full line of reliable, fuel-efficient and fun-to-drive automobiles for American car buyers through approximately 1,000 independent U.S. Honda dealers. The Honda lineup includes the Accord, Crosstour, Civic, Fit, CR-Z, Insight and FCX Clarity passenger cars along with the Pilot, Odyssey and CR-V sport-utility vehicles, the Ridgeline pickup and the Odyssey minivan. Honda has the highest brand fuel economy1, the most top safety-rated2 vehicles and the longest-lasting cars3 of any mainstream automotive brand in America. Honda also has been producing automobiles in America for more than 30 years and currently operates 15 major manufacturing facilities in North America. In 2013, more than 94 percent of all Honda and Acura vehicles sold in U.S. were made in North America using domestic and globally sourced parts. 1 Based on model year 2012 fuel economy data from the U.S. Environmental Protection Agency and its report: "Light-Duty Automotive Technology, Carbon Dioxide Emissions, and Fuel Economy Trends: 1975 Through 2013" 2 Based on the number of models by automotive brand that earn a TOP SAFETY PICK or TOP SAFETY PICK+ rating from the Insurance Institute for Highway Safety for model year 2014. 3 Longevity based on IHS Automotive, Polk U.S. vehicles in operation registration statistics 1988-2012 for Honda and non-luxury competing brands. 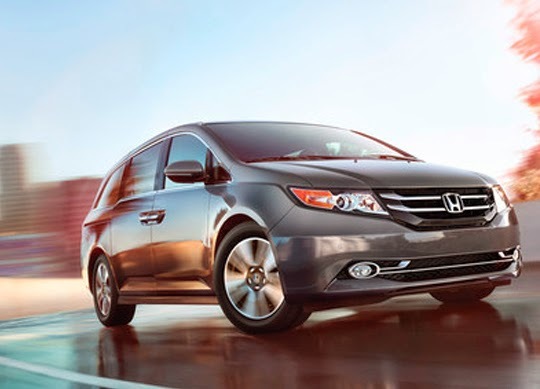 The 2014 Honda Odyssey (automobiles.honda.com/odyssey/) has won the 'Best Minivan for Families' award for the fourth consecutive year as part of U.S. News & World Report's annual 'Best Cars for Families' honors. The top safety-rated1, best-selling2 Odyssey was praised for gathering excellent reviews from professional auto critics along with its innovative feature content, including the world's-first in-vehicle vacuum system, HondaVac™. "The Odyssey was designed to excel in one of the harshest environments on earth, daily family use," said Mike Accavitti, senior vice president of automobile operations for American Honda. "Being named 'Best Minivan for Families,' four years in a row speaks volumes about the Odyssey's singular commitment to be the ultimate family vehicle." U.S. News considered 210 vehicles for the 'Best Cars for Families' awards. The award methodology combines professional automotive reviews, safety and reliability ratings, seating and cargo volume and the availability of family-friendly features. Within each of the 19 automotive categories, the vehicle with the highest composite score is named the Best Car for Families in that category. The 2014 Honda Odyssey, the top-selling minivan in the U.S. in 2013 to individual buyers2, continues to lead its class in fuel economy and safety ratings, while providing spacious accommodations for up to eight passengers and a refined and engaging driving experience. The Odyssey was the only minivan to qualify as a 2014 IIHS TOP SAFETY PICK+, and the Odyssey has earned the best possible overall safety rating from NHTSA with a 5-Star Overall Vehicle Score.3 Additionally, the Odyssey is rated at a remarkable 28 mpg4 Highway, the highest EPA highway fuel economy rating of any eight-passenger minivan. 1 The Odyssey was the only minivan to qualify as a 2014 IIHS TOP SAFETY PICK+ as of March 1, 2014 and the Odyssey has earned the best possible overall safety rating from NHTSA with a 5-Star Overall Vehicle Score. 2 Based on IHS Automotive, Polk new-vehicle retail registration data through the end of December 2013. 3 Government 5-Star Safety Ratings are part of NHTSA's New Car Assessment Program (www.SaferCar.gov). Model tested with standard side airbags (SABs). Vehicles tested under the new program cannot be compared to MY10 and earlier vehicles. Japanese automakers manufacturing in the United States is nothing new. But it was in November of 1982 when the first Honda Accord rolled off the assembly line in Marysville, OH. It was the first Japanese vehicle assembled in the US, and in the nearly 32 years since, Honda has made 10 million Accords here for a total of 20 million cars manufactured in America – enough to span from New York to San Francisco twenty times. It's that double landmark which Honda is now celebrating. Honda has come a long way in those three decades, keeping that original plant in Marysville on line while expanding to three more – in East Liberty, OH; Lincoln, AL; and Greensburg, IN – with a fifth plant (the Performance Manufacturing Center) opening on the same site in Marysville to build the Acura NSX next year. It also builds engines in Lincoln and in Anna, OH, and automatic transmissions at Russells Point, OH, and Tallapoosa, GA. The 10 millionth U.S.-built Honda Accord rolled off the assembly line today at Honda's first U.S. auto plant in Marysville, Ohio, as all four Honda auto plants in America celebrated the cumulative production of 20 million automobiles in the U.S. Honda also marked the achievement at two engine and two transmission plants that build the powertrains used in Honda's U.S.-built cars and trucks. "We are deeply aware that our ability to reach this milestone results from the trust that 20 million customers have placed in our products, and we appreciate their support over the past three decades," said Hidenobu Iwata, president and CEO of Honda of America Mfg. and head of Honda's North American manufacturing. "We also value the commitment made by tens of thousands of associates at Honda and our hundreds of suppliers in the U.S. who build products of the highest quality for our customers." Honda's U.S. plants produced a record 1,309,917 automobiles in 2013, an increase of 7.4 percent from the previous annual mark set in 2012. Honda is supported by a network of 533 suppliers in the U.S., with purchasing of parts and components last year exceeding $23 billion. Honda's four U.S. auto plants are supported by engine manufacturing in Lincoln, Ala. and Anna, Ohio, and the production of automatic transmissions in Russells Point, Ohio, and Tallapoosa, Ga. These plants have produced 23.77 million automobile engines and 18.64 million transmissions in the United States. In 2013, nearly 95 percent of the Honda and Acura automobiles sold in the U.S. were produced in North America. The Honda of America Mfg. Marysville Auto Plant shattered its previous all-time high by producing 492,409 vehicles last year, up 12 percent from 2012, while the East Liberty Auto Plant produced 242,363 light trucks last year. This resulted in record production of 734,772 Ohio-made vehicles at the two plants in 2013. This includes 69,680 vehicles for export to more than 40 countries. Honda Manufacturing of Alabama produced 333,556 vehicles along with their six-cylinder engines in 2013, just shy of its all-time high set in 2012, due to a major model change for the all-new 2014 Acura MDX. 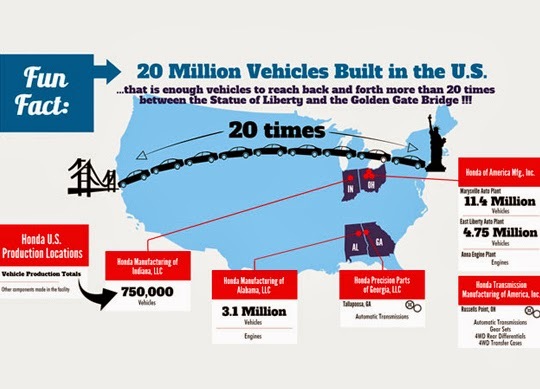 The Alabama plant produced 20,466 vehicles for export to 49 countries in 2013. Honda Manufacturing of Indiana produced a record 241,589 automobiles last year, up 21 percent from 2012. The Indiana plant started auto production in 2008 and added a second shift in 2011. It produced 18,559 vehicles for export last year. Honda has the capacity to produce 1.92 million cars and light trucks in North America at eight auto plants, including in Canada and Mexico. Production recently began of the 2015 Honda Fit at a new auto plant in Celaya, Mexico. With the new Celaya plant, Honda now has the capability to build virtually every product in its lineup in North America, from sub-compact models to light trucks. Honda began automobile production in the U.S. in 1982. It now operates nine major manufacturing facilities in the United States, producing a wide range of Honda and Acura automobiles, automobile engines and transmissions, Honda all-terrain vehicles, and power equipment products such as lawn mowers, mini-tillers and general purpose engines, using domestic and globally sourced parts. Backing out of a parking spot isn’t exactly the most challenging part of anybody’s day, but it certainly is a heck of a lot easier now than it was ten years ago thanks to the invention of the rearview camera, now standard on many 2014 model year Honda vehicles. Honda's efforts in the areas of enhanced driver visibility have been recognized by the National Highway Traffic Safety Administration (NHTSA) as part of its 5-Star Safety Ratings program (also known as the New Car Assessment Program (NCAP)), with nearly all Honda and Acura models with rearview camera systems becoming the first vehicles in the industry to be recognized by the U.S. Department of Transportation for having met its Advanced Technology Feature performance criteria (http://1.usa.gov/Pv0lKq). Honda vehicles earning this first recognition from NHTSA for the application of recommended rearview camera systems (what NHTSA calls rearview video systems) include the Honda Accord Coupe, Sedan, Hybrid and Plug-In, Civic Coupe, Sedan, Hybrid and Civic Natural Gas, Crosstour, CR-V, CR-Z, Fit EV, Odyssey, Pilot and Ridgeline1; as well as the Acura ILX and ILX Hybrid, MDX, TL, TSX, RDX, RLX and RLX Hybrid (see table below). Additional Honda and Acura models that have been equipped with standard rearview camera systems are expected to have their rearview camera systems recognized as Advanced Technology Features in the near future, including the all-new 2015 Fit subcompact car and 2015 Acura TLX midsize luxury sedan, both launching in spring 2014. "Rearview cameras are an integral part of Honda's approach to enhance driver visibility," said Art St. Cyr, vice president of product planning and logistics at American Honda. "By the 2015 model year all Honda and Acura models will have rearview cameras standard on all models, yet another example of how our company is committed to enhancing the visibility and safety of our customers and everyone on the road." 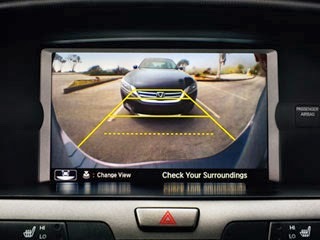 The addition of rearview video systems to NHTSA's list of recommended Advanced Technology Features was intended to encourage manufacturers to improve the rearview visibility of their motor vehicle fleet; the NCAP Advanced Technology Features also include Forward Collision Warning (FCW) and Lane Departure Warning (LDW) systems which also are offered on many Honda and Acura vehicles. More information about crash avoidance technologies that are part of the Government 5-Star Safety Ratings program can be found at safercar.gov. Starting with the 2013 Honda Crosstour, American Honda has taken a comprehensive approach to enhancing driver visibility and confidence on the road, beginning with the widespread application of rearview cameras. More than 94 percent of Honda and Acura models sold in the U.S. in 2013 were equipped with standard rearview cameras. Rearview cameras are just one aspect of American Honda's 360-degree approach to enhanced driver visibility and situational awareness, demonstrated by the broad application of technologies such as FCW and LDW systems on Honda models. These systems use a camera mounted behind the windshield or a front mount radar system to warn drivers of a potential collision with a vehicle detected in front of them, or to alert drivers if the car is unexpectedly moving out of a detected lane. Other available features aimed at improving driver visibility are the Expanded View Driver's Mirror, Honda LaneWatch display and Acura's Blind Spot Information (BSI) system. In addition to applying the next-generation Advanced Compatibility Engineering™ (ACE™) body structure to most of its models, American Honda has applied the following safety features on all its models as standard equipment: Vehicle Stability Assist™ (VSA®) with traction control; an Anti-lock Braking System (ABS); side curtain airbags (most vehicles equipped with a rollover sensor as well); dual-stage, multiple-threshold front airbags; and front side airbags. Other available safety and driver-assistive technologies available on Acura vehicles include the Collision Mitigation Braking System™ (CMBS™) and Lane Keeping Assist System (LKAS). For more detailed information about Honda's history of leadership in the development and application of advanced technologies and vehicle designs that are meant to enhance the safety of all road users, please view our Safety Issue Brief. Honda has a long history of leadership in the development and application of advanced technologies and designs meant to enhance the safety of all road users, including automobile occupants, motorcycle riders, and pedestrians. The company operates two of the world's most sophisticated crash test facilities and is responsible for numerous pioneering efforts in the areas of crashworthiness, airbag technology, collision compatibility and pedestrian safety. American Honda leads the industry for 2014 in third party crash test ratings with more models rated TOP SAFETY PICK and TOP SAFETY PICK+ by the Insurance Institute for Highway Safety (IIHS) than any other manufacturer. 1Honda Ridgeline's rearview camera system on models with Navigation does not meet the requirements to be a recommended advanced technology feature. Ask anybody who’s ever started a family, and they’ll tell you that it’s every bit as rewarding and exhausting as everybody said it would be, but what parents don’t often find out until a few years into their tenures as breadwinners and heads of household is that a new family can often come with the need for a new family vehicle. For San Diego Honda customers, this should be an undeniably exciting thing. 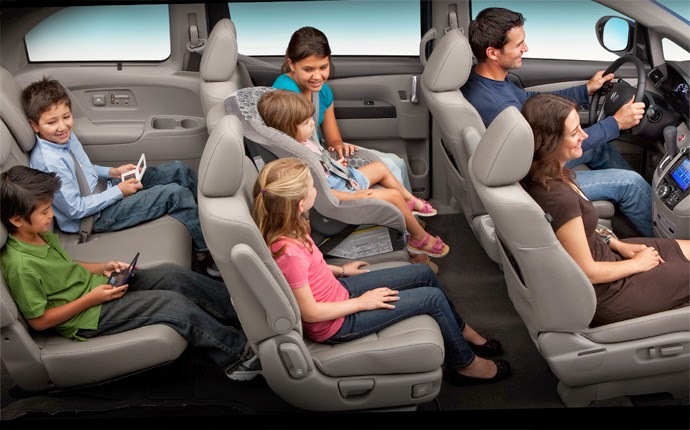 With the recent release of the U.S. News and World Report list of 2014’s most family-friendly cars comes the announcement that the 2014 Honda Odyssey is this year’s top minivan for families. While we understand that many consumers are not at all interested in the idea of purchasing a minivan because of long-held stigmas they may have for that classification of vehicle, the Honda Odyssey is not your typical minivan: this is the one that famously includes a built-in vacuum cleaner, but it also can feature TVs in the headrests, an HDMI input for a Blu-Ray player, and a cooled storage box for snacks and drinks. Plus, it’s extremely spacious, safe, and reliable, which are very important qualities for families looking for a people-mover that can push deep into six-digits on the odometer and put up with everything from soccer practices to cross-country vacations. It is, quite frankly, a very excellent minivan, and we here at Pacific Honda were elated to see U.S. News include it on this year’s list of top family vehicles. Minivans were invented for families, but the Honda Odyssey has helped take the minivan to a whole new level of excellence. American Honda automotive operations have long been separated by function rather than by brand. These moves will result in exclusive divisions, with dedicated sales and marketing teams for Honda and for Acura. Both brands will be housed under a single "American Honda Auto Division" to be headed by John Mendel, executive vice president of what is now called the Automobile Sales Division. "Our goal is to accelerate the already strong sales growth of the Honda and Acura brands through a more cohesive strategy, with a heightened focus on the unique needs of luxury and mainstream customers," said Mendel. "These moves will more completely align the major activities for the Honda and Acura brands under dedicated brand leaders to take advantage of new opportunities in the marketplace with greater speed and efficiency." "The realignment strategy that has created a new Acura Division reflects our growing commitment and the increased level of resources and leadership we are focusing on the Acura brand on a global basis," said Mendel. "The best time to make a change is when you're in a position of strength and we are not only coming off a great sales year, we are continuing to create new opportunities with a series of new and exciting Honda and Acura models," said Mendel. Sales of Acura brand cars and trucks totaled 165,436 vehicles, an increase of 5.9 percent, and its best sales total since 2007. Further, sales of the Acura MDX and RDX in 2013 combined to achieve Acura's best sales year ever for light trucks. 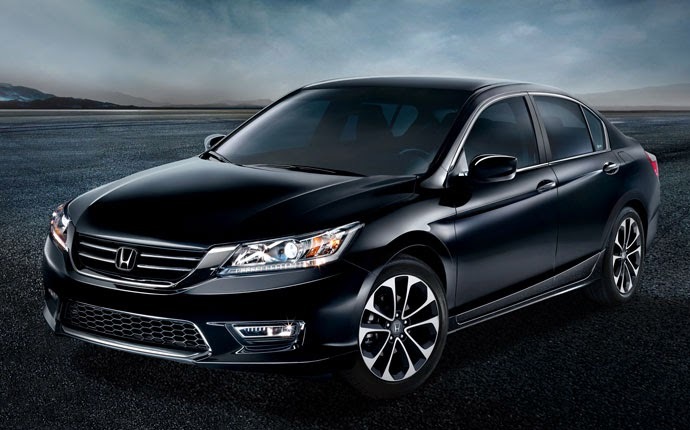 Honda Start Something Special -- "Bob's Accord"
Honda and Microsoft Giving Away Four Xbox One Consoles! Sometime during the Christmas season, Microsoft released the new Xbox One console, the most cutting-edge and up-to-date video game console that Microsoft has ever released. While there were plenty of people willing to shell out $500 for the system right then and there, several other consumers were perfectly content with their previous-generation Xbox 360 consoles, mostly because they still ran fun games and, perhaps more importantly, were already completely paid for. Never mind what the executives say – we've had a sneaking suspicion all along that the upcoming Honda Civic Type R won't be coming to North America. And with good reason: both the prototype we drove in Japan and the concept unveiled at the Geneva Motor Show last week were based on the European-spec Civic hatchback – not to mention that some of the best hot hatches remain out of our reach. Well it turns out we're not the only ones with that concern. There are legions of Honda hot hatch enthusiasts right here in the good old U S of A who want to see the new Civic Type R ripping up the Great American Road. And many of them are taking to the cyberclouds demanding that Honda bring it Stateside, post haste. As of the time of writing, this online petition has gotten over 6,000 digital signatures, needing less than 1,500 more to get to the author's target of 7,500 votes. Of course, if and when the petition reaches its target, that still won't mean that Honda will bring it over, but it could mean that extra bit of encouragement the Japanese automaker's executives would need to tip the scales in our favor. Not that we haven’t already said this about a million times, but the 2014 Honda Accord is a really, really good car. It’s spacious, efficient, reliable, safe, and technologically-advanced, and of course, it wears the badge of one of the most trusted automakers in the world. 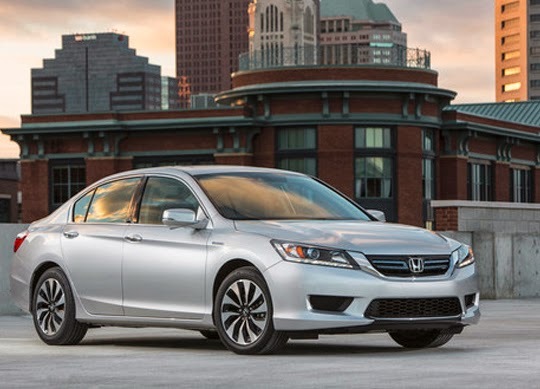 For those reasons, Honda dealerships across the country have sold a ton of these vehicles, but we were all recently given a pretty pleasant surprise when it was revealed that consumers purchased more Honda Accord models than any other car in America for the 2013 calendar year. Geneva, Switzerland, March 4, 2014 - Today sees the worldwide reveal of the Honda Civic Type R Concept model which points to the styling direction for the exterior design of the highly-anticipated production new Type R that will debut in Europe during 2015. 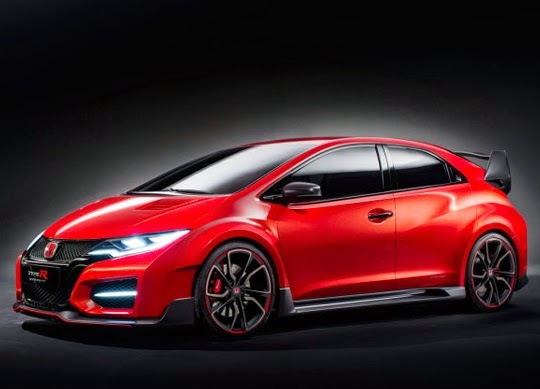 Described by the design team as a 'racing car for the road' rather than a high performance version of a road car, the new Type R looks set to signal a new era for the marque – with the most extreme Civic Type R yet. The sleek and aerodynamic profile reflects a car designed for performance whilst maintaining the look of a road car and the distinctive character of Type R.
While further detail on performance is yet to be announced, Honda has confirmed that the forthcoming new Type R will be the first model in Europe to feature one of its brand new VTEC TURBO engines from the Earth Dreams Technology range. The two-litre, direct injection, four-cylinder turbo is expected to deliver class-leading output of at least 280PS and will be EURO 6 compliant. While turbo engines have not been seen in Honda's production cars in Europe for some time, Honda has continued to actively develop turbo technology on the race track and in other regions. Honda's successful return to WTCC in 2013, has been instrumental in gathering knowledge that has helped shape the new Type R, providing the development team with analysis and feedback on performance and styling collected from the track. America's midsize sedan segment is one of the most crowded and fiercely competitive in the business. The Toyota Camry has long been our nation's best seller, while the Honda Accord has dutifully come in second place, like some sort of codependent Cal Naughton Jr. riding Ricky Bobby's back bumper. There was that one year, 2001, when the Accord briefly broke the Camry's streak, marring what would today have been a 17-year-long run of best-selling car titles. 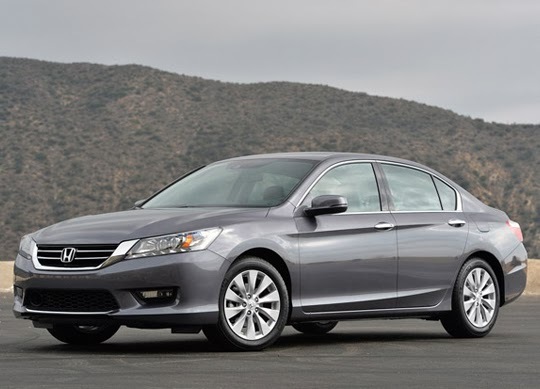 The Accord pulled the opposite move in 2011, letting sales slip far enough to let not only the Toyota by, but the Nissan Altima and Ford Fusion, as well. Aside from those anomalies, the Camry and Accord have been first and second in this segment since before many of you readers could even drive. It's 2014, and these frenemies have never before faced a threat to their world order as strong as today's class of family sedans. The aforementioned Altima and Fusion are perhaps the most capable challengers, but the Chevrolet Malibu, Hyundai Sonata, Kia Optima, Volkswagen Passat and Mazda6 are all capable of convincing new buyers to walk their way. Autoblog predicts the lineup of best-selling midsize sedans is about to be shuffled. "We gave the current-generation Camry a pretty harsh review, and were it not for Toyota's fiercely loyal customer base and increased incentive and ad spending, the king might have already stepped aside". The question for Honda is whether or not the Accord's latest redesign is good enough to keep it ahead of this charging pack of competitors, or whether it follows the leader right off the podium steps. Few would argue that the new shape isn't an upgrade over the prior model, though it has been hit with criticism for being too derivative. 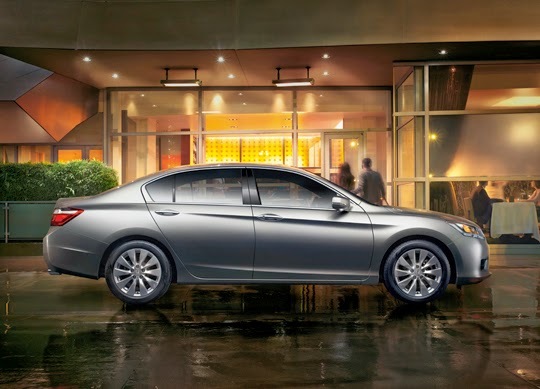 Honda played it decidedly safe with the Accord's styling when the sedan was redesigned last year. Few would argue that the new shape isn't an upgrade over the prior model, though it has been hit with criticism for being too derivative, particularly in the rear where it could be mistaken for a 2008-2014 Hyundai Genesis (it's not the worst thing in the world to draw likenesses to class-above sedans). The dimensions of the new design are perhaps more interesting than the way it looks. The Accord is now some 3.6 inches shorter in length, while also being shorter in overall height and a touch wider than the last-generation model. The vehicle's stance certainly reflects those changes, and the wider front fascia that flows into gently upswept headlights looks more aggressive to our eyes, while at the same time remaining recognizable as both a Honda and an Accord. Those exterior dimensions, of course, also affect how much room there is inside, and on paper, at least, there's less: 103 cubic feet of passenger volume, down from the prior generation's massive 106. Fortunately, the exterior shrinkage hasn't made the Accord feel appreciably smaller on the inside, with plenty of space available in all directions and wide, comfortable seating for all. In fact, many key interior metrics have grown, like rear legroom and trunk space (up over a cubic foot to 15.8). Those three missing cubic feet of passenger volume appear to have been taken off the top, as front and rear headroom have both taken dips. Despite our tester's moonroof, however, there was still plenty of clearance, even for passengers with six-foot, two-inch frames. Many key interior metrics have grown, like rear legroom and trunk space. The new dimensions have also dropped the Accord down a class in the Environmental Protection Agency's classification system; whereas the prior Accord (eighth generation, for those counting) crossed the threshold of 120 cubic-feet of combined passenger volume and cargo space to become a fullsize car, the new Accord's 118.8 cubic-feet of combined interior space keeps it among the midsizers. In top-trim Touring spec like our tester, the Accord's interior impresses with high-quality materials like nicely trimmed leather seats and dashboard plastics that generally look and feel better than is typical of this pricepoint. Almost everything about the interior, from its space and materials to the ergonomics of little things like the smartphone-sized cubby next to the power and USB ports, is well thought out and easy to use. Except the infotainment system. With our First Drive of the new Accord having been conducted in a Sport model lacking the upgraded infotainment system, this is our first chance to talk about Honda's dual-screen system in the Accord. The first screen is a large eight-inch unit that's deeply embedded at the top of the center stack. This display is not touch sensitive, but rather controlled via rotary knob controller and set of buttons at the very bottom of the center stack. These controls, however, still require a reach, because they are not laid flat on the center console, so they don't fall readily to hand like many other high-end systems. Below this big screen is a smaller display dedicated to audio functions. This display is touch sensitive, and lets you perform simpler tasks like switching music sources and advancing tracks. "We have a few issues with this setup, the first being its redundancy and generally poor use of the audio-only screen." We have a few issues with this setup, the first being its redundancy and generally poor use of the audio-only screen. Most of the functions it performs can also be performed on the main screen using the knob controller, and the interface itself is more difficult to use than a simple set of physical buttons, because tasks often require the extra step of switching between screens. Our second gripe concerns operating the system on the larger screen using the single rotary knob and buttons. In particular, the Menu button manages to confuse because it doesn't go to a top-level menu as expected. Rather, it takes you to a menu of options for whichever part of the system you happen to be at that moment, be it Navigation, Phone or Audio. Lastly, the presentation of the system is decidedly a few years behind next-gen systems coming out from Honda's competitors. The graphics, fonts and colors layered atop a confusing hierarchy of menus and controls makes the whole system feel like Windows 95 when everyone else is rocking Windows 8. We've tested many other systems in this competitive set and have found simpler schemes that rely on a single, large display with either touchscreen or well-designed central controller – this system is too complicated for its own good. That doesn't mean Honda doesn't know how to do technology in these modern times, as our Accord also came equipped with the brand's new LaneWatch system. Any time the right turn signal is activated, a camera mounted underneath the passenger-side mirror is used to project a view of the car's blind spot, along with handy distance markers, on the main infotainment screen. At first we thought LaneWatch might be an overly complex solution to the simple problem of people not adjusting their mirrors properly, but in practical use, we found it not only helpful, but preferable and more trustworthy than the mirrors themselves. "The ability to run on half its cylinders helps the Accord achieve excellent EPA-estimated fuel economy figures." While many midsize challengers have ditched offering a six-cylinder engine altogether, the Accord continues to make the heavier, more powerful engine option available. In this case, it's Honda's well-proven 3.5-liter V6 that produces 278 horsepower at 6,200 rpm and 252 pound-feet of torque at 4,900 rpm. While one might think the Accord would suffer a big penalty at the pump for such a powerful mill, the opposite is actually true, thanks in large part the Honda's comparatively svelte curb weight and its Variable Cylinder Management system. While cylinder deactivation technology is nothing new, its application on a V6 is rare outside the engine bay of a half-ton pickup. The ability to run on half its cylinders helps the Accord achieve excellent EPA-estimated fuel economy figures of 21 miles per gallon in the city, 34 on the highway and 26 combined. Our results were even better, with the trip computer reporting an average return of over 30 mpg after a week of mixed driving. The official numbers put this Accord ahead of all top-trim midsize sedans, including the Fusion, Sonata, Optima and Malibu, all of which offer powerful turbocharged and direct-injected four-cylinder engines in their most expensive models. We've noticed that these high-tech forced-induction fours tend to get strong window-sticker EPA numbers but fall flat out in the real world. This Honda doesn't make economy promises that it can't keep. "The Accord is still at the front of the pack in terms of handling." Of course, the Accord's engine management system will tell three cylinders to take a rest every chance it gets, even more so when the car's Econ button is pressed. While amazing fuel economy is the result, the byproduct is an occasionally rougher-running engine you can feel through the steering wheel and pedals. The vibrations while running on fewer cylinders might not bother some, but we found them very noticeable, and there's no setting to turn off the Variable Cylinder Management system entirely, so they're practically always present with the engine dropping and bringing cylinders back online constantly. Honda says that all Accords are also fitted with an Active Noise Cancellation system, but we found the overall levels of noise, vibration and harshness to be average at best – definitely not approaching industry leaders in that area from near-luxury brand Buick, which use a similar Bose-branded noise cancellation technology in its Regal, a slightly more expensive (and smaller) rival. The Accord doesn't sell hundreds of thousands of units per year because it's such a smooth operator, though. We'd venture to say the car's reputation for offering the most engaging handling among midsize sedans is its chief selling point (along with a history of reliability and a strong dealer network that combines to inveigle legions of repeat customers). We're happy to report that the Accord is still at the front of the pack in terms of handling. Pairing a very rigid unibody platform with a MacPherson strut front suspension and multi-link rear suspension yields a highly diversified setup that's comfortable counteracting imperfect city streets but also stable and composed when the pace picks up and the turns become sharp. While the steering system has become all-electric in this latest generation, its accuracy and weight still feel sharp and natural, though there is a lack of feedback from the road through the wheel. Likewise, the brakes that measure 11.5 inches up front and 11.1 inches at the rear are go-about-your-business great, offering perfectly natural feel through the pedal. "There's no other family sedan on the market with mechanicals that operate in such harmony." Having driven nearly all of this year's midsize contenders, we can say there's no other family sedan on the market with mechanicals that operate in such harmony. From the powertrain to the transmission to the suspension to the steering, all of the Accord's subsystems are on the same page with each other from the moment the start button is pressed. Most of its competitors nail one or two of these disciplines, but rarely do they come close to a complete package like the Accord (the Mazda6 is the exception, though which is better is close enough to be a matter of taste). What's more, there's even a six-speed manual transmission still available on LX, EX and Sport models, though the EX-L V6 and our Touring tester are only available with this well-tuned six-speed automatic. Really, the only fault we could find out on the road with this Accord was not with its mechanicals, but with the Adaptive Cruise Control system that exhibited some worrisome behavior. We set the ACC during a long trip on the highway and discovered that when traveling through a left-hand bend with something like a big pickup or semi truck on our right, the radar-based system would register that vehicle as being in our path and the Forward Collision Alert system would sound its alarms and flash warnings in the instrument panel. At the same time, we suspect the Brake Assist system had also precharged the brakes, because when our foot instinctively went to tap them, we got more braking power than we expected. An unsettling experience each time, this happened more than once during our trip. We can't rule out that the bumper-mounted radar on our particular test vehicle may have been misaligned or otherwise defective, but we've experienced this fault on other automakers' vehicles with similar systems before as well, so we doubt it. Lastly, the Accord Touring we tested features a base price of $33,480 with a destination and handling charge of $790. At first blush, that may seem more expensive than its pack of competitors, but note there's not an option available that isn't standard with this trim. For instance, while a Ford Fusion Titanium may start lower at $30,600, once navigation, adaptive cruise control, blind spot alert, lane departure warning, heated seats and sunroof are added, its price has ballooned to $34,410. "The Accord ups the ante with its improved design, more interior space and efficiency that belies the power of its remarkable V6." What we find with the 2014 Accord Touring is a lineup-leading model that bodes well for the future of Honda. Still among the very best-handling midsizers in this market, the Accord ups the ante with its improved design, more interior space where it counts and efficiency that belies the power of its remarkable V6. The issues we identified with the infotainment system may be a sticking point for some, especially those comparing the experience closely across the entire segment, but there are lesser trim levels available that go without navigation yet gain a much more straightforward interface. Indeed, it's not so egregious a failing that Accord sales have suffered because of it, and we don't see anything about this new generation that will threaten its place among the segment's top sellers. "At this point, the only thing preventing the Accord from being America's best-selling car are a bunch of stubborn Camry buyers."